Decorated with geometrical printinner with embroidery, this calf-length indo western kurta is sure to slot seamlessly into the casual wardrobe. 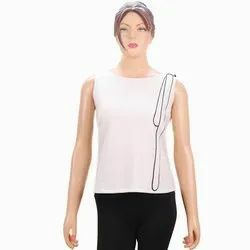 Our company has earned accolades in offering Ladies Stylish Top to the clients. This product is manufactured with the help of optimum grade material and modern technology in accordance with the latest trends of the market. Ladies Stylish Top is designed as per the prevailing fashion trends in the market across the globe.